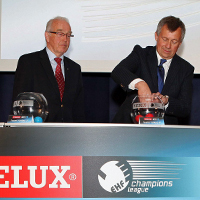 The Group Matches of the EHF Champions League and the Group Phase in the VELUX EHF Champions League will be drawn on Tuesday 28 June 2011. On Tuesday 28 June at 11:00 hrs (local time), the draw for the Group Phase of the VELUX EHF Champions League and the Group Matches of the EHF Women's Champions League will take place in the Gartenhotel Altmannsdorf in Vienna. The event will be streamed live at www.ehfTV.com with interviews and reactions following the draw. In the Group Matches stage sixteen teams will meet in four groups with four teams each. Each team will face every group opponent twice. The winners and the runners-up of the four groups go through to the Main Round stage. In step one a team from Pot 1 is drawn and then allocated to Group A, B, C or D. This procedure is repeated for the other teams in Pot 1. This procedure is then followed with Pots 2 and 3. According to the regulations, teams from the same country are protected from meeting each other in the Qualification Tournaments and the Group Matches of the EHF Women’s Champions League. Therefore the four teams of Pot 4 – the teams from Qualification Tournament Phase 2 – will be allocated to the first possible position from left (Group A) to right (Group D), according to the seeding. Download the 2011/12 EHF Women’s Champions League Seeding List. In the Group Phase stage sixteen teams will meet in four groups with six teams each. Each team will face every group opponent twice. The teams ranked on place 1, 2, 3 and 4 in the four groups go through to the Last 16 stage. In step one a team from Pot 1 is drawn and then allocated to Group A, B, C and D. This procedure is repeated for the other teams in Pot 1. This procedure is then followed with Pots 2. According to the regulations, teams from the same country are protected from meeting each other in the Group Phase of the VELUX EHF Champions League. Therefore in total eight teams in Pots 3 to 5 will be drawn into the four groups, making sure they do not end in a group with already a team from that country in it. In the last step the teams from Pot 6 are drawn and allocated to Groups A, B, C and D. Please note that the winner of the Wild Card Tournament has no protection and is allowed to meet opponents from the same country. Download the 2011/12 VELUX EHF Men’s Champions League Seeding List. People unable to attend the draw in Vienna on Tuesday 28 June 2011 at 11:00 hrs (local time) in person can follow the draw on our live ticker on www.eurohandball.com or watch the live web stream on www.ehfTV.com. The stream will broadcast the draw event, followed by interviews with club representatives and reactions to the draw results. Join the community of handball fans on Facebook and be the first to receive updates on the happenings in the VELUX EHF Champions League and the EHF Women’s Champions League.